The Bishopsteignton Outdoor Art Group (BOAG) only has one rule and that is: ‘if it stops being fun, we stop’. From humble beginnings in 2005, the group has produced a remarkable number of ‘outside art’ projects given that the members are all volunteers with limited time, no budget and allegedly little artistic skill. From the first project on The Hump making a giant willow wave with ‘seaphenalia’ woven in to commemorate the Year of the Sea, to a number of larger recycled art projects for TRAIL, we’ve had a lot of fun and consumed a lot of cake! 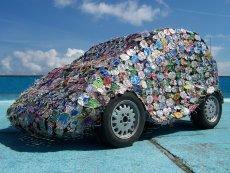 ‘Genetic Twist’ a DNA double helix spiral made out of over 6,000 CDs was our latest creation for 2010. 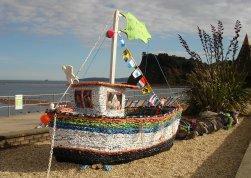 It was exhibited in TRAIL on Teignmouth seafront during the summer. We’ve also painted ‘beach huts’ for the school, produced several art trails around the village for Christmas and held ad hoc ‘Art & Run’ days where the group go to a site, such as a beach or woods, and make art out of whatever they can find there, letting the weather or tide naturally erase it. Anyone in the village or nearby surrounding area can join the group. No particular artistic skills required, but a sense of humour is desirable! Please contact Gill Greatorex 01626 779628 or e mail gillgreatorex@o2.co.uk.